Much of what we hear about influencer marketing is centered around reach and engagement objectives. This is not unlike the early days of social media marketing programs where platform capabilities and user behaviors created a perfect storm for connection and interaction. Fast forward to today and we’ve certainly learned that social media is not a silo of communication, but more of a universal truth when it comes to where people spend their time to discover, consume and interact with content. Influence brings that same universal truth in terms of something that affects us all. From a marketing context, influence is the ability to affect action and since virtually every person with a phone is empowered to publish, everyone has some degree of influence. So where does that broader view lead us when developing an influencer content marketing strategy that’s optimized to attract, engage and convert? To help answer that question and extend optimization to retention and advocacy, here are 5 states during the customer journey and how influencer marketing can play a part for better results. Contribution inspires promotion. The obvious value here is that working with influencers on content can inspire promotion of the content collaborated on. Reaching the audience of an influencer with content that is relevant and credible can be incredibly valuable for brands that want to attract hard-to-reach customers. Follow the leader advocacy. Influencers that are advocates often inspire other influencers and customers to advocate for the brand as well. This can be architected with contests where the content with the most social engagement wins, but basic follow the leader behavior in an organic way is effective too. Retargeting influencer interest. When followers of an influencer that the brand co-created content with match a customer profile, marketers can retarget those followers who have interacted with the influencer content with more context than a buyer simply visiting random websites. A great B2B example of an Attract approach to influencer co-creation is this interactive experience for SAP Leonardo (client). 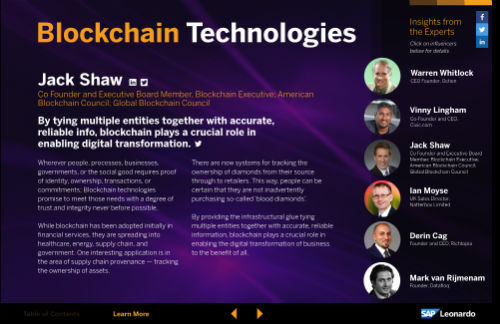 32 influencers contributing their expertise on topics ranging from artificial intelligence to blockchain technologies. With over 1.8 million impressions and 100% influencer share rate, this content collaboration project exceeded reach expectations. Creator talent drives interaction. In the B2C world, creators are plentiful and by creators I mean people will great media creation skills AND the charisma to attract an engaged audience. Creators can bring unique talent to the planning, creation and promotion of content that brings a fresh perspective and higher engagement to an otherwise tired marketing mix. Authenticity drives engagement. When microinfluencers also represent the customer that a brand is working to engage, the authenticity and voice of the customer that they bring to content collaboration can result in more content interaction and sharing. Relevance is essential in all things marketing and when the influencer’s audience and the brand channel for promotion match well, then engagement is more likely to be high. 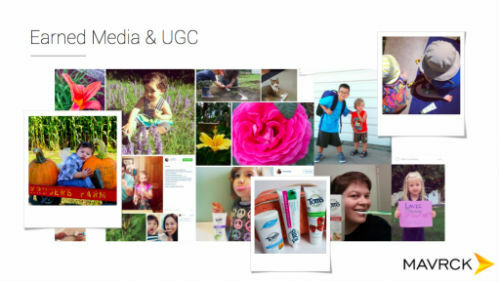 An impressive B2C Engage example would have to be Tom’s of Maine that focused on micro-influencers to create and amplify content on social channels. Results per 1,000 micro-influencers activated: 6,496 likes, shares and comments; 1.7 million friends reached, 4,270 survey responses captured. You can read the full case study on the Mavrck site. Trust motivates. Few things motivate conversion more than trust and the essence of what makes someone influential is that their community trusts them. Therefore, trusted influencers who are involved with brand content that is mid to end of funnel focused can help increase conversions. Familiarity brings confidence. Another thing about relevance is that influencers that have a reputation for recommending products and services have developed familiarity with their audience for that behavior. Working with a new brand and talking about a topic or a product / service (with appropriate ad disclaimers) can inspire transaction. Credibility is believability. 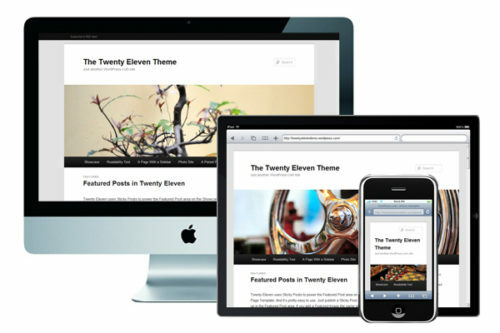 The more credible a brand’s content is, the more likely it is to persuade and inspire action. Influencers can bring that credibility. 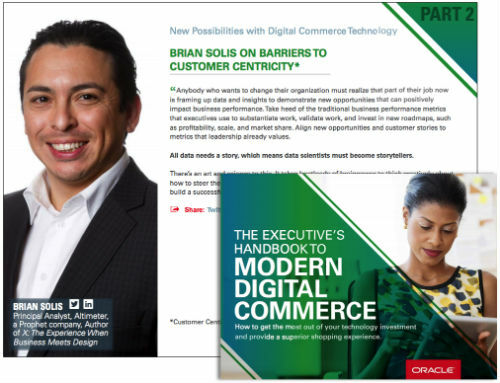 A B2B pilot project we implemented for Oracle included a formidable 68 page ebook called the Executive’s Handbook to Modern Digital Commerce which featured influencers including Brian Solis, Stephen Monaco, Ed Cleary, Stewart Rogers and other B2B digital experts. The credibility of this ebook produced in combination with industry experts resulted in exceeding the conversion rate goal by 260%. Bring utility to the community. Expanding the scope of who is influential to customers and community, brands can engage with influencers to participate in their community on everything from general best practices or tips to how to get the most out of the brands’ product/service. Employees are influential too and showcasing staff in brand content can help humanize the brand with customers. Infotain customers to stay. Engaging creators to develop useful content that is also entertaining for customers can go a long way towards retaining those customers. 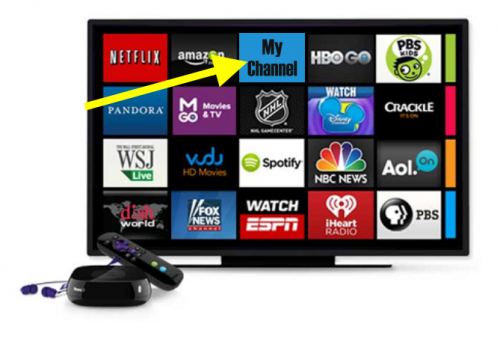 These can be routine communications to announcements or updates. I think a great B2C example of Retain focused influencer content is the recent British Airways safety video featuring famous celebrities including Mr Bean (Rowan Atkinson), Gordon Ramsay, Gillian Anderson (yes, she’s British), Thandie Newton, Sir Ian McKellen and a few more. I flew BA multiple times in a short period recently and this video was definitely a watchable part of the experience for me as a customer. Activate advocates. Bringing it back to reach through brand advocacy, brands can expand their view of influence to customers and activate those who show brand love to support sharing the good news. Influential customer stories are powerful. Customer testimonials alone are great. Testimonials with customers that are influential, either personally or the brand, can go a long way towards supporting advocacy efforts. Incentivize the good news. Incentives for referrals amongst influencers can inspire advocacy, but there must be an ad disclosure if compensation has been, or could be paid for that promotion effort. So, instead of thinking about influencers on the day you publish that amazing content you’ve worked so hard on, consider a more strategic approach that puts influencers in a partnership position to collaborate from the start. When you map out the stages of your customer journey and the content needed to help buyers make that journey, think about how working with influencers, experts and advocates can add that special sauce to your marketing mix. Think about how the addition of credible experts with active audience engagement can add valuable perspective, inspiration, promotion and trust for conversion to your marketing content – across the entire customer lifecycle: attract, engage, convert, retain, advocate. Of course if you would like to explore the true benefits of when the Content Marketing World and Influencer Marketing World intersect, well, that’s what we do at TopRank Marketing. We focus mostly on B2B influencer content programs but would be happy to chat about any projects you have in mind and then point you in the right direction. 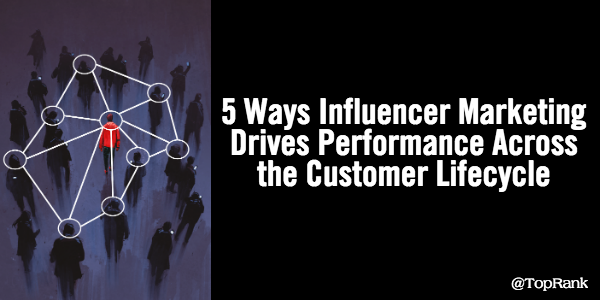 The post 5 Ways Influencer Marketing Drives Performance Across the Customer Lifecycle appeared first on Online Marketing Blog – TopRank®.